It’s National Disabilities Month again, dear readers, and today I’d like to talk more about gaming. However, this isn’t going to be a look at specific games or video game characters. We’ve done that bit to death. Instead, let’s talk about how gaming is being used as an actual therapeutic treatment for people with disabilities (PWD). The use of gaming as a form of physical and/or occupational therapy isn’t just good for the body. It’s FAR MORE fun than a standard physical therapy session. Believe me, I’ve been through physical and occupational therapy many times, and the sessions can be soul-crushingly boring! Who wants to sit around doing the same movements over and over and over again? I, for one, would rather be doing something I enjoy. Changing up from standard therapy to something like gaming really gets people in a different frame of mind, and can make rehabilitation fun. There has also been a lot of progress in this arena over the years, and it seems to have ramped up quite a bit recently. 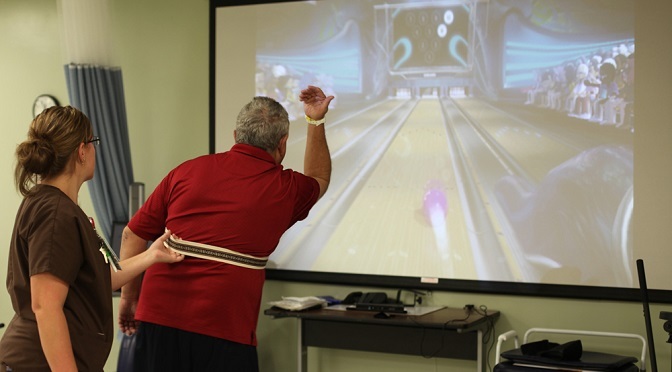 In 2009, there was a study performed with elderly patients at risk of falls, which utilized the Wii Bowling game to improve the patients’ balance and their gait (i.e. the manner in which they walk). After just six (6) sessions of this therapy, the patient’s balance and gait were measurably improved, and the results suggest that this kind of therapy is beneficial to reducing fall risks. In 2012, another case study was done along these lines, but this time using the Wii Fit. This time, the system was used in an effort to improve aerobic capacity (the measure of the ability of the heart and lungs to get oxygen to the muscles) for patients who otherwise were not very mobile. To reiterate what I said above, using something like the Wii or the Wii Fit can be much more engaging to a patient who may be getting bored of their “same old, same old” routine in therapy. Can you get a high score? Can you beat your score from the last session? Think of the motivational aspect of that! As far as specific games for treatment go, one was actually developed by the University of Southern California’s Institute for Creative Technologies back in 2013, and the program is still running today. Mystic Isle, a simplistic yet charming VR-style game, allows people who have had a stroke to rehabilitate the affected portions of their body through movement. It can be set up in a clinical or home setting, and captures the players’ movements through the use of the Microsoft Kinect (See? the Kinect is good for something). The game also quantifies and tracks patients’ movement in space as they tackle a series of rehab exercises, so therapists can get tangible data about their patients’ progress. There are also systems for smaller-scale treatment out there. How many of us who sit and type at computers all day have ever gotten even a minor case of carpal tunnel syndrome? What about more severe hand injuries like broken bones or nerve damage? Well, there’s a piece of equipment out there known as the Music Glove that’s just for those cases. Therapists at the UPMC Rehabilitation Institute designed and implemented this neat little item to help with hand therapy, and it has apparently been well-received by patients. The glove allows patients to move their hands & fingers along with upbeat music, exercising the affected muscles. It uses an interface that looks a lot like what gamers have seen with games like Guitar Hero or Rock Band, and like Mystic Isle, the glove tracks progress and gives medical professionals a good data set for how the treatments are working. Now we come to something a little more obscure, but by no means any less cool. In fact, in my opinion, this is one of the coolest things I’ve written about in a long time. The website for CAREN (or Computer Assisted Rehabilitation ENvironment) bills it as “a versatile, multi-sensory system for clinical analysis, rehabilitation, evaluation and registration of the human balance system”. While it’s not as compact as the Wii or the Kinect, CAREN allows for a multitude of treatment options, with three typical set-ups. Patients can watch an IMAX-like screen that wraps around them, and move through various environments while supported by a sling-like device. The CAREN system can be used to improve gait, balance, strength, aerobic capacity, and probably has some application in the realm of weight loss, too. It’s technology and innovation like this, in the field of gaming, that has those of us who live with disabilities more interested in actually following through with our treatment(s), getting motivated to move and heal, and generally improve our quality of life. It’s also giving therapists and other medical providers a new way of looking at treating patients, and could potentially better the relationship between patient and medical professional. All in all, gaming can do some amazing things for people with disabilities, and I for one hope that this kind of thing continues and that we see more cool stuff like this in the near future. If you liked this article, here’s a treat for you: A few of us here at PCU will also be speaking about disabilities and gaming at this year’s Awesome Con in Washington DC. Come out and join the discussion on Saturday, March 31! Also, let us know what you think about the use of video games for therapy, dear readers; and stay tuned to Pop Culture Uncovered as we continue to geek out!